October 2008 – And What Should I Do In Illyria? beyond measure. I am and my son is, to have such amazing guides. All these beloved people have shaped my and Chad’s life and will do the same for Elijah. This is my sweet and gentle Mamaw. This is my beautiful, faithful and incredibly kind mama. I want to be like these two ladies. This is my strong, sensitive and compassionate Daddy. This is my grand-daddy, an amazing man of faith, prayer and wisdom. I hope my son takes after both of these men. This is Chad’s mama. She is the most generous and giving person I have ever met. She will give anyone the shirt off her back with incredible love. She inspires me. He took a whole hour and 15 minutes to be born!! Geez! 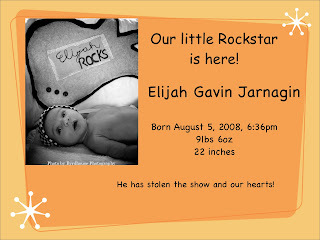 his birth announcement. So cute! !